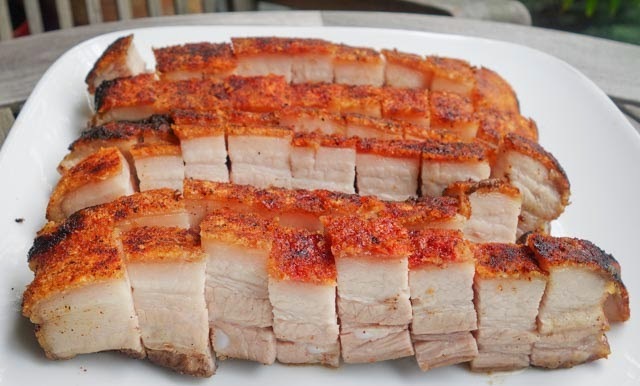 If you love pork, you will love Sio Bak: the Chinese way of roasting it. The meat is cut into bite size cubes and you use a pair of chopsticks to dip it into some sauces. The skin is crisped, crackling and flavourful and the meat is moist and tender. I have been to some Western restaurants (Michelin-star, mind you) offering roast pork belly as a dish and I have to say that using a knife and fork to eat a slab of of it just does not make culinary sense. The crackling skin cracks apart when knifed. I have seen versions where the skin is offered separately. Why separate the perfect marriage of the layered skin, fat and meat, which offers a burst of different flavours and texture in a bite? I have also eaten versions where the skin is removed. I often wondered where the tegument went, along with it's unique texture and flavour. And others come with the meat falling off all over the place. I suppose "slow-cook" pork belly means this. Not only is the succulent bite gone but the flavours seem to have disappeared. I suppose that is where brining comes in. I have eaten pork which tastes like a bunch of herbs. Pork should taste like pork. No? I do not want to come across as a food snob here nor do I want to belittle other ways of cooking roast pork belly. I merely want to point out how superior the Cantonese way of cooking it is. And how our local and budding cooks, mostly schooled in French-Italian cuisine, need to take time to master various aspects of our Asian cuisine. There is even a rather hilarious story-tradition to this recipe which I have written here. Coming back to home-cooking, you can do a very good slab of sio bak in your kitchen. I wish I could share with you a recipe which uses the oven (only) to cook this perfectly. 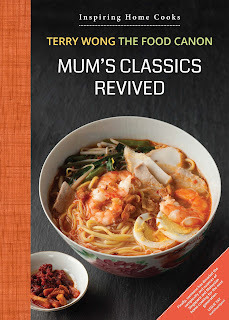 Indeed, there are recipes on the net such as Leslie's which can show you how to do that. Since I started to make it using Sous Vide, this has been my go-to method. It is convenient as there is minimum cooking attention time. The method is also precise and repeatable, a big plus for the home cook as we do not roast pork every day. There can be variations each time you cook i.e. the way the oven heats up, types of pork belly, the size of the slab etc. The Sous Vide method simply equalises these factors and prepares a slab of pork which is perfected for the final stage of crisping the skin. I will summarize the recipe here again, using the SV method, with some additional cooking notes. 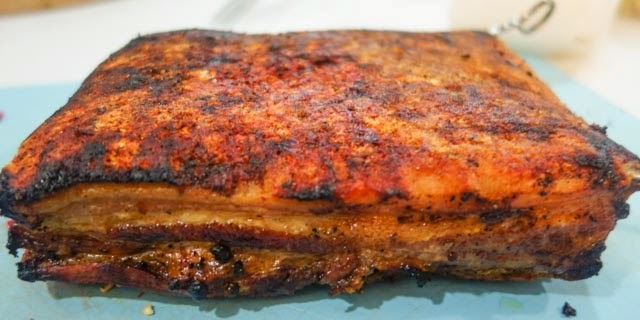 Pork Belly: A rectangle slab of pork belly of 1 to 1.2 kg fits nicely into most SV appliances and is neat for slicing later. Just multiply the slabs if you want to cook more. Choose cuts with layers of meat and fat. It is sometimes called 5-layer pork. Flattening the slabs: It will be harder to crisp the skin if the slab is not flat after it is SV-cooked (oil will congregate in some spots when you crisp the skin in the oven). You can choose to flatten the slab after you have SV-cooked it, i.e. put a weight on it. But it is easier to just stick two skewers in, crisscrossing the slab (see pic) before you SV. Vacuuming: Vacumn-pack your slabs and add 3 tsp of salt, 2 tsp of white pepper and 1 tsp of 5-spice powder to the bottom side of the meat. 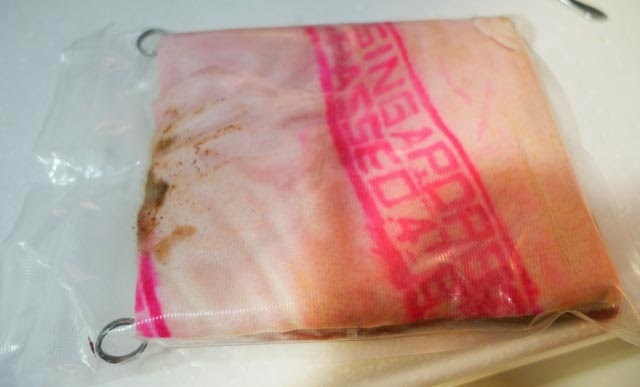 You can also use Zip-Lock bags suited for cooking as the belly slab will fit snugly. Carefully push out as much air as possible before sealing. Cooking: Cook the packs in 72C for 6 hours in the water bath. This cooks the meat to a perfect texture for Siu Bak. You can also choose to increase it to 78C for a softer texture. Drying the skin: Cut open the slabs and pour away the liquid. Marinate the bottom of the slab with 2 tsp of white pepper and 1 tsp of 5-spice powder. Find a way to dry the skin i.e. leave at top shelf in a fridge for overnight, have a fan blow at it for 1-2 hour or just hang it up to dry. I should add that there were occasions when I just wiped the skin dry and grill it immediately. The skins still crisp up eventually, albeit the need to scrape off some charred parts. Crisping the skin: Sprinkle salt generously on the skin. Some will advocate poking holes in the skin but I don't think it makes any difference. Put the slab skin-side up in the oven, using top-grill at 200˚C for 20 mins (or more). Keep an eye on it as it will char quite suddenly at one point. It is no disaster to have black spots. Remove the slabs, let it cool and then, scrape off the black spots using a knife. If your slab is flat, it should crisp evenly. If not, a few curved spots towards the edges will remain chewy. Just don't offer those parts to guests and reserve it for something else. Slicing: Use a chopper. Place the meat skin-side down. Slice the meats in long strips, giving the chopper a knock to cut through the skin before it hits the chopping board. 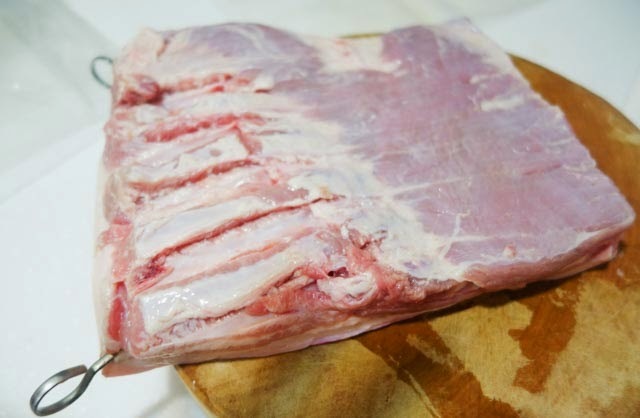 Depending on how flat your slab is or the type of belly use, you can choose to cut off the bottom meat part for better presentation. Now, slice the strips into bite size pieces. Just let the chopper drop and it should slice through nicely. You will hear a nice crisp sound :). The pork can be enjoyed as is or with mustard or other savoury sauces. I have shared quite a bit of details here but once you get it going, after a few lots, you will get good at it. I don't consider Sio Bak done this way difficult to cook, even for larger parties. Cooking attention time is only 20 minutes and you do not need to be stressed up why worry about drying up the meat using the oven-only method, which can happen as you enthusiastically try to crisp up the skin. And you won't need to sauna in front of the oven either for 1-2 hours which means you can focus on cooking something else. 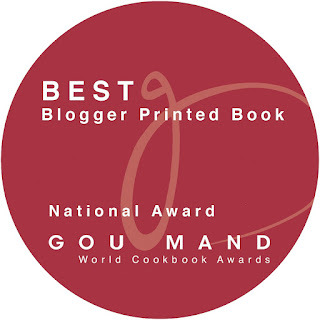 As for Sous Vide appliance, my favourite one - Codlo - is still a-coming. A few months delay but signs are that in October, they should be ready for shipping. sharp end of the skewer can puncture the plastic bag. You can also use a thick satay stick for this. The skin has been crisped. Almost 60% of it was charred and the black parts had to be scrapped off. If you arrange it neatly, it can be presented upright. Do you feel that different types / country of origin / etc of pork makes a big difference? I've tried your method a couple of times and mostly it was quite a success. Except my last try of some frozen spanish pork belly from Mmmmm, the skin simply wouldn't crisp even after 30mins in a 225deg broiler! If we don't have a sous vide appliance, can you recommend doing it in a slow-lo oven? What temperatures should we use? Floberita - Apologies for late reply. You can do a 2 hours slow roast at about 120C for 1.5.hours and then raise it to 180C for the last half an hour. Every oven is different and there are other variables..you have to experiment with yours. Timing...I will give the frozen Spanish pork belly a try next time I visit mmmmm and will let u know if I can get it right. May I ask, for the crisping up step - do you use the grill/broil function (top heat only) or the bake/convection function (all-over heat) in your oven? And Do you place the pork on the topmost rack? Thanks for the clarification! m - i use the grill (heat from the top). I place rack at the mid level. Just can't seem to get that consistent keropok crust I'm looking for! I agree with you now, having tried your recommended 6hr SV, albeit at 78C, that sio bak shouldn't be too soft. That said, I tried brushing on vodka while letting the post SV belly air dry in the fridge overnight, hoping it would boost my attempt for keropok. But alas keropok still eludes me. My belly skin turned out inconsistently crunchy and mostly sticky/chewy. Even after broiling for an extended time. Clearly still a lot of moisture in my belly skin and/or the fat hasn't rendered out enough. My quest continues. Maybe I'll stick exactly to your recommended 72C next. Thanks for your reply and post all the same!